Fabulous unobstructed views of Beaver Creek with the convenience of city living. 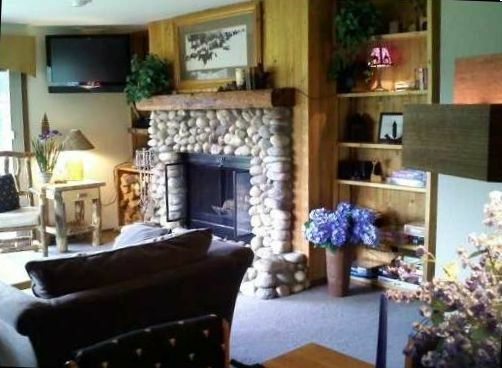 This unit has a stone wood-burning fireplace, lakeside views, and cozy mountain decor. Stay at this well-appointed ground floor condo with covered parking, within walking distance to Avon Rec Center, restaurants, and bike trails. Avoid parking fees at Beaver Creek - take the shuttle service right from the condo's parking lot then take the free Gondola to the Beaver Creek ticket counter! Or take the low cost shuttle to the bus hub and hop on the bus to Vail to avoid parking fees. We are a skiing family and have enjoyed Beaver Creek ski hill since it's inception. We invite you all that the Vail Valley has to offer - both winter and summer! Avon Rec. Center is about 10 blocks down a pedestrian path. There is a charge for using this Center. Please check their website. This is the third time we've stayed at Buck Creek in Avon. It's a perfect location either summer or winter. This unit has nicely refurbished bathrooms and everything we needed for a family of 3 (in our case)...would certainly handle more. Pamela is very responsive and a pleasure to work with. Thank you for your kind review! Hope to have you as our guest again in the future! We strive to have our home as comfortable as yours. The condo was perfect! Had everything we needed and was so convenient to be able to walk out the door to the lake. Beds were comfy. We didn’t use the sofa bed so not sure how that was. Only bad thing was we tried to vacuum since we tracked in some grass and the sliding door to the closet was broken so we could not get the vacuum, but not a big deal. We would definitely stay again. The owners were easy to deal with. We are glad you enjoyed your stay. Thank you for letting us know about the sliding door which has since been fixed. We hope to have you back again soon to enjoy the beautiful Colorado summertime! We were completely satisfied with the condo. It's location was convenient and close to town and Beaver Creek, where we skied. Vail was a bit further but still very convenient. The kitchen had everything we needed. The two bedrooms and two bathrooms provided us with the space and privacy we wanted. The wood burning fireplace was stocked and ready to enjoy, which we did! The covered parking space was perfect. The view out the living room was lovely. We would stay again and highly recommend it! Thank you for the wonderful review. We are so glad you were pleased with everything! We hope to have you back again soon to enjoy the sun and snow! We have stayed in this lovely condo before and came back to it because we love the location. Sitting on the ground-floor deck in the afternoons watching the families enjoying the lake or biking or playing Disc Golf has become one of my favorite vacation pastimes. Avon is a very friendly town and it's not unusual for people to say 'Hello' when passing by. We plan on returning every summer. Had a great time. Very comfortable, well maintained, fully equipped to be a home away from home! We loved this condo! We are very fortunate to stay for one week in this condo in July 2015. Everything about the condo was perfect and as described. Nice furniture and decorating. Amazing view. Worth of mentioning is that the City Avon’s July 4th firework was right outside of the condo on the lake. Honestly speaking, I have never experienced a more spectacular firework night. The condo is also very close to everything in Avon.